A visual sign or word representing a brand can be termed as a trademark. It can be just a name, or a word, a label or even numbers that is chosen by a company to represent a particular product or service it is offering. A trademark is used to differentiate the company’s products or services from another company or companies’ products or services. This is particularly important when the products and services offered by two or more companies are same or are of similar nature. Once a trademark is registered, it becomes an intellectual property of the business which the business must protect under the laws. The Controller General of Patents Designs and Trademarks under the Ministry of Commerce and Industry registers trademarks in India. The rules and regulations of trademarks followed are as per the guidelines mentioned by the Trademark Act, 1999.
Business owners need to fill up an online application form to initiate the trademark registration process. 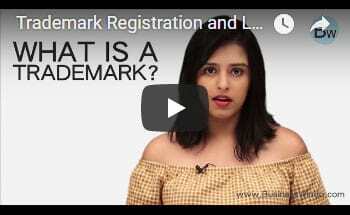 It is also important to ensure that the trademark name, logo or symbol that has been applied for is available for registration and not being used by other company or brand. There are several advisors who can provide you with guidance on how to register your brand name in Bangalore India. Once the trademark is finalized, an appropriate category needs to be selected for it. There are various categories of trademark and it should be classified under the correct category. Once the application is filed, the applicant will get a unique TM number and after one and a half to two years the trademark is registered provided there is no objection raised by competitor brand or companies. The brand can then use ® as a suffix to its name. A registered trademark is valid for ten years, after which it can be renewed for another ten years for a nominal fee. A name, number, or word, and even sounds and images can be trademarked. Names can contain first or second name of the person applying, or the family name involved in the business. Words or phrases which are not indicative of the product or the service being offered can be proposed for trademark registration. The trademark can also partly or wholly contain numbers, shapes, alphabets, symbols and sounds. It is recommended that you consult experts if you wish to apply for name, symbol or logo registration in Bangalore and other major cities in India. Protect your brand name through trademark registration: Registering a trademark provides the business with sufficient protection for its brand and its offerings. Business owners have the right to sue other businesses or brands if they feel that the rights of their trademark have been compromised. This is not possible if the trademark is not registered. By registering a trademark the business owners can gain a strong ground in the industry. It proves that the business has carefully invested its time to endow a legal status to its brand and that the products maintain quality standards. A registered trademark also renders the brand an identity that is easily recognizable and unique. This gives the products a better customer recall and presence in the market. A company can treat its trademark as an asset. Just like any other asset the business owners can sell, franchise, or create a commercial contract for the trademark. Companies can use the trademark filing in India to register a trademark abroad. Likewise, people or businesses from other countries can also apply for a trademark registration in India. TM and R is Prestige of your Brand and your Company. Who can Apply for Trademark Registration? A business owner or company can apply for a trademark registration. The business owner can be an individual, company, proprietor or society. It is often advised by experts to file for the registration as an individual. This is because in case the business or the society changes or gets dissolved, the trademark becomes invalid but it continues to be valid even when the individual is not a part of the business. Step-1: The first step is to search for the availability of the trademark that the applicant wishes to apply for. The proposed trademark must not be already in use by other brands or similar to an existing one. If the trademark is similar or has direct resemblance to any competitor’s brand, there are chances that an objection will be raised and the application might be rejected by the Government. A logo or a symbol in a trademark must be submitted in black and white. Step-2: Once the name, logo, symbol etc for the trademark is finalized, the applicant has to fill up necessary application forms and sign the authorization letter for the lawyers to pursue the registration process. It is to be noted that the application for registration can only be done by certified lawyers. Applicants need to fill Form-48 that grants the right to the lawyer to file the registration. There are several certified consultants that help you apply for trademark registration in Bangalore and other cities in India. Step-3: On receiving the authorization form and verification of details, a TM number is provided to the business. The brand can immediately start using TM with its name. Using the TM symbol will signify that the brand has applied for a trademark registration and hence the name, words or symbols in use are the brand’s intellectual asset, waiting for registration. Once the application is submitted, it goes for verification to the concerned department of the Government. The Government also has the right to raise a complaint in case it finds that the proposed trademark is offensive, religious or has definite similarities with other trademarks in the industry. Step-4: In case the authorities are fine with the contents of the trademark a notification is given in the Trademark Journal. The notification is kept for around four months and if no external parties file an objection, the trademark is approved and registered within the next six months. If there is an objection raised by any party, there will be a hearing before the registrar and any fees arising for the legal process needs to be borne by the applicant. After the trademark registration, the brand can use the registered symbol after its name. Step-5: The main documents needed to apply for trademark registration in India are identity and address proofs and company incorporation documents if the application is done on behalf of a partnership, company, etc. What You will Get After Trademark Application?